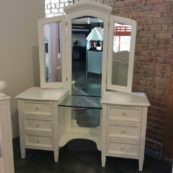 Looking for kids vanity Los Angeles? From playing dress-up to hosting top-notch slumber parties to applying makeup for the very first time, there is perhaps no item of furniture more fun (or more essential) than a high-quality vanity for kids. Discover the perfect piece to suit your little princess right here at Kids Only Furniture. Because we are the best resource for children’s vanities in Los Angeles, you will find one that you love. Our collection of kids vanity Los Angeles combines beautiful design with high-quality craftsmanship. Our children’s vanity is not only enjoyable to use, but also adheres to the highest standards of safety, durability and non-toxicity. Each kids vanity is built with both style and usability in mind. So you can rest assured knowing that your child will be safe and love their new furniture. We’re pleased to offer the most coveted and well-crafted children’s vanities in Los Angeles. Our selection includes multiple drawer and desk configurations, lovely matching stool sets, and a wide variety of shapes, sizes, and decorative mirror accents. Whether your child’s tastes tend toward simple and sweet designs, classic and sophisticated touches, or vintage-inspired elegance, we have the styles and brands of vanities for kids to perfectly fit your unique space. Visit one of our conveniently located showroom in Burbank to find the perfect vanity for your kid. Our selection kids vanity Los Angeles guarantees you’ll find something you like. Be sure to contact us if you have any questions.